Corporate meetings, event and travel software company Lanyon has bought Berkshire-based mobile applications provider GenieConnect. The acquisition means Lanyon’s customers will have access to mobile innovations such as multi-event apps, iBeacon, gamification, interactive maps, and social media walls. The application will help event organisers better manage their events, understand their attendees with real-time analytics, and track on-site behaviours to help make smarter business decisions. GeneiConnect is already integrated with many of Lanyon’s solutions and the two companies have previously collaborated on high-profile events. David Bonnette, Lanyon CEO, said: "Leading companies are looking to consolidate their entire meetings, events and travel programs with one provider, and mobile is a key element. Until recently, all they had to choose from were disparate point solutions. "Today they are looking for a suite of solutions to seamlessly manage everything from small meetings to group room block management to their largest annual conference. 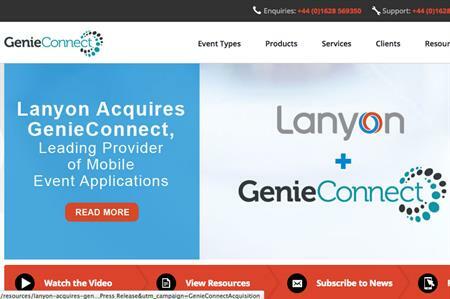 By adding GenieConnect’s cutting-edge mobile application to Lanyon’s Smart Events Cloud and RegOnline, we further expand the value we provide as the only enterprise-wide suite of solutions with advanced mobile capabilities." Through GenieConnect, Lanyon’s global customers will have access to mobile innovations including multi-event apps, iBeacon, gamification, interactive maps, and social media walls. Lanyon has been active in 2014, merging with Active Network Business Solutions in February and taking over group reservation technology provider Passkey in April.